is a symbol of marriage union in South Asia. It is a sacred thread of love and goodwill worn by women as a symbol of their marriage. Traditionally the mangalsutra is considered the most revered token of love and respect offered to the bride during the marriage ceremony. The word three knot tie literally means "an auspicious thread which is knotted around the bride's neck". It is usually a gold pendant strung from a yellow thread prepared with turmeric, a string of black beads or simply a gold chain. It is comparable to the wedding ring of the West. A married woman is expected to wear this thread and is the most important part of a Hindu marriage ceremony. In certain local cultures, the groom ties the first of the three knots while his sisters tie the rest. Apart from the mangalsutra, the Toe rings, the Kumkum, bangles, Nallapoosalu and nose ring form the six sacred symbols that indicate the woman is married. is also worn by the brides of Kerala's Syrian Christian community. 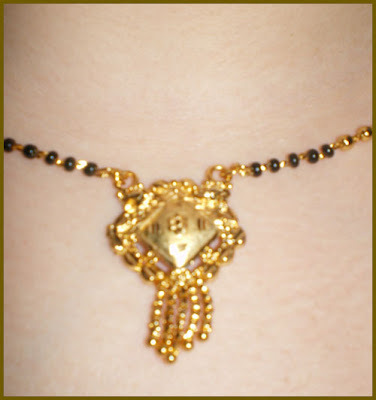 Mangalsutra are made in numerous designs. The common ones are the Lakshmi thaali (worn by the most Hindus), Ramar/Pottu thaali (worn by the Telugus and Kannadigas), Ela thaali (worn by the Malayalees) and Kumbha thaali (worn by the Tamils of Kshatriya caste). The design is chosen by the groom's family according to prevalent customs. 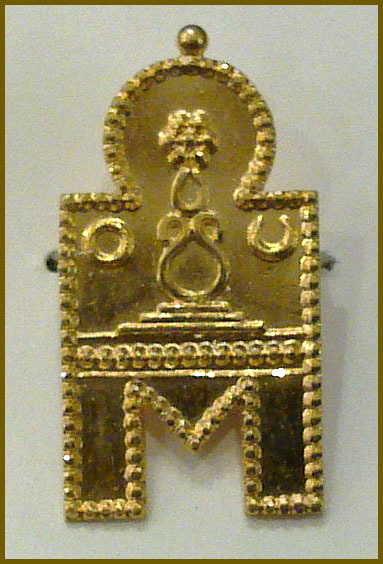 Gujaratis and Marwaris often use a diamond pendant. Maharashtrians wear a pendant of one or two vatis. The Bengali, Oriya and Assamese don't have the custom of Mangalsutra.